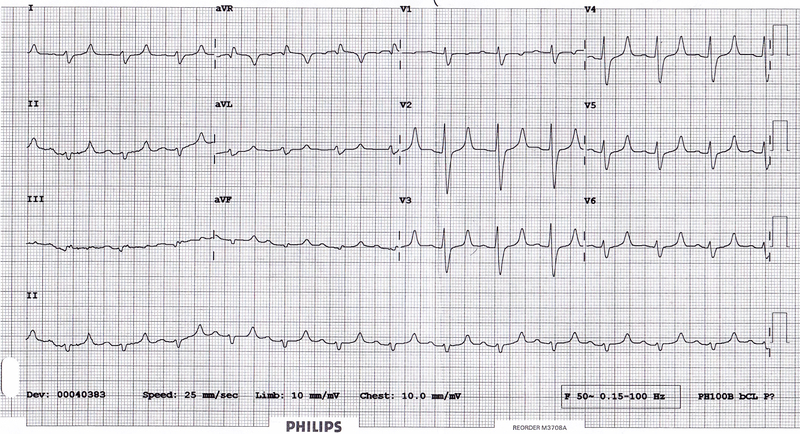 A nurse hands you this ECG to sign-off saying, “this lady is generally unwell and has been drowsy & vomiting for 3 days. She doesn’t look well but doesn’t speak any English”…..
Where do we go from here ?? What do you do next ?? Sorry for the slow reply team !! – Agreed with your comments and trekked to her bedside to get an urgent K+ off…. the results can be found in the sequel !